The NTSB has issued four safety recommendations and reiterated one older recommendation to prevent runway excursion accidents following tailwind landings. On December 22, 2009, American Airlines flight 331, a Boeing 737-800, N977AN, ran off the departure end of runway 12 after landing at Kingston-Norman Manley International Airport (KIN), Jamaica. The aircraft landed approximately 4,000 feet down the 8,911-foot-long, wet runway with a 14-knot tailwind component and was unable to stop on the remaining runway length. After running off the runway end, it went through a fence, across a road, and came to a stop on the sand dunes and rocks above the waterline of the Caribbean Sea adjacent to the road. No fatalities or postcrash fire occurred. This recommendation, A-07-61, was issued following the December 2005 runway excursion accident involving a Boeing 737-700 at Chicago-Midaway Airport. The National Transportation Safety Board (NTSB) issued three safety recommendations on flight crews’ ease of access to fire extinguishers while oxygen masks are donned. 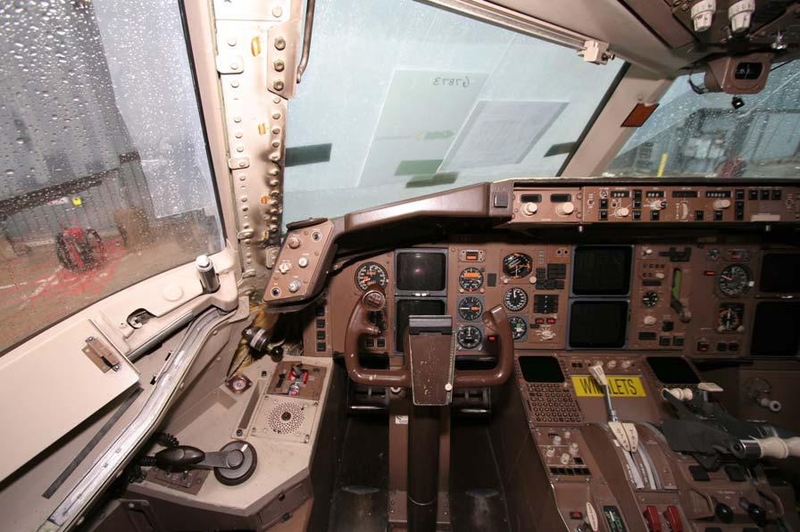 These recommendations were made following the Boards investigation into an incident in which the crew of a Boeing 757 were face with a fire at the windshield heat terminal connection in the cockpit. The flight crew diverted to Washington Dulles International Airport, VA, and landed without further incident. No evacuation was conducted, and none of the 7 crewmembers or 105 passengers sustained injuries. In addition to the factors that led to the fire, NTSB’s investigation of this incident revealed a safety issue concerning 14 CFR Part 121 flight crews’ ability to readily access fire extinguishing equipment while wearing the oxygen masks and goggles that they are instructed to don at the first indication of smoke, fire, or fumes. During postincident interviews, the flight crewmembers of the incident flight indicated that they immediately donned oxygen masks and smoke goggles in accordance with the United Airlines Boeing 757 Smoke, Fire or Fumes checklist. The captain reported that he left his seat because the flames were in front of him and he needed to immediately reach the fire extinguisher, located on the back wall of the cockpit next to the jumpseat. The captain stated that, as he moved toward the fire extinguisher, his oxygen mask and smoke goggles were “torn off” because he had reached the end of the hose attached to the oxygen mask. He removed the fire extinguisher, put the mask and goggles back on, and discharged the extinguisher until it was empty. The captain reported that the fire was suppressed but reignited within seconds and that, as he moved toward the cockpit door to retrieve a second extinguisher from the cabin crew, his mask and goggles came off again. He retrieved the extinguisher, put his mask and goggles back on, and discharged the extinguisher, fully extinguishing the fire. The National Transportation Safety Board (NTSB) is investigating an air traffic control incident involving two regional jets that occurred on Monday, May 16, 2011 at Chicago O’Hare International Airport. At approximately 09:35, ExpressJet Airlines flight 6075, an Embraer ERJ-145, was cleared for takeoff on runway 32L at Chicago-O’Hare (ORD), en route to Buffalo, NY (BUF). SkyWest Airlines flight 6958, a Canadair CRJ-200 (N905SW), arriving at O’Hare from Muskegon, MI (MKG), was cleared to land on runway 9R. Aircraft approaching runway 9R cross runway 32L at low altitude before landing. Because of the timing of the two operations, the SkyWest flight nearly overflew the departing ExpressJet flight. A supervisor on duty in the tower noticed the traffic on the runway and the traffic on the approach and instructed the controller handling the SkyWest flight to direct the pilot to go around. The SkyWest pilot discontinued the initial approach as instructed. The ExpressJet flight continued takeoff roll and departed without further incident. The SkyWest flight returned a few minutes later and landed. There were no injuries or damage to either aircraft. Safety Board investigators are reviewing radar data, air traffic control audio recordings, and statements provide by the pilots of the aircraft involved. Preliminary radar information provided to the Safety Board by the Federal Aviation Administration indicates that the SkyWest aircraft crossed runway 32L approximately 225 feet above the ExpressJet aircraft when the two aircraft were laterally less than 480 feet apart. The crash of an ATR-42 cargo airplane while on approach to landing at Lubbock, Texas, was caused by the flight crew’s failure to maintain a safe airspeed, which put the plane into an aerodynamic stall at an altitude too low from which to recover, the NTSB determined. Poor crew resource management, flawed decision-making and human fatigue were cited as contributing factors to the crash that left the captain seriously injured and the first officer with minor injuries. 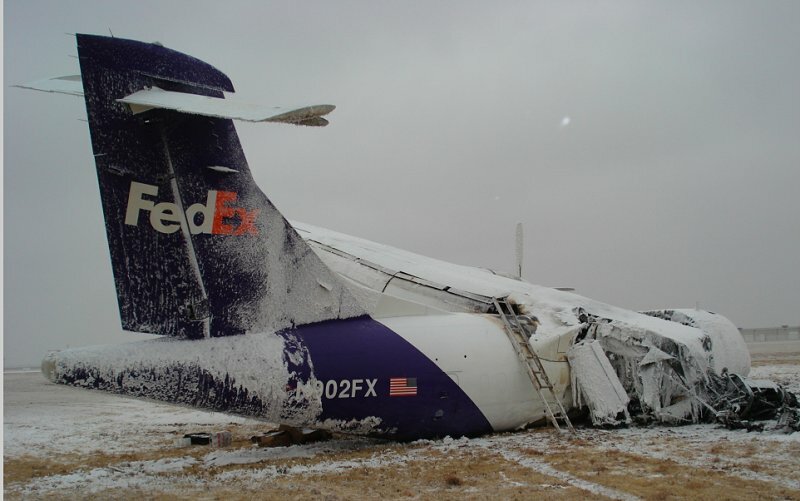 On January 27, 2009, at 4:37 a.m. CST, an ATR 42-320 (N902FX) operating as Empire Airlines flight 8284 between Ft. Worth and Lubbock, was on an instrument approach when it crashed short of the runway. The airplane, which was registered to Federal Express Corporation (FedEx) and operated by Empire Airlines, Inc., was substantially damaged. The aircraft, which had departed Ft. Worth about 84 minutes before the accident occurred, encountered icing conditions while en route to Lubbock. And although the airplane accumulated some ice during the flight that degraded its performance, the NTSB determined that the aircraft could have landed safely had the airspeed been maintained. During the approach into Lubbock, at about 1400 feet above the ground and about 90 seconds from the runway, the captain indicated a flight control problem saying, “We have no flaps.” Although the crewmembers had been trained to perform a go-around and refer to a checklist if a flap problem occurred during an approach, the captain chose to continue the approach as he attempted to troubleshoot the flap anomaly while the first officer flew the plane. Neither flight crewmember adequately monitored the airspeed, which decayed to the extent that the stick shaker activated, which warned of an impending aerodynamic stall. The captain continued the unstabilized approach even though he received additional stick shaker activations and an aural “pull up” warning from the terrain awareness and warning system (TAWS). At that point, the plane was descending at a rate of over 2,000 ft per minute. Although procedures for responding to either the stick shaker or the TAWS warning require the immediate application of maximum engine power, the captain did not apply maximum power until 17 seconds after the TAWS warning. Seconds after maximum power was applied, the airplane entered an aerodynamic stall and crashed. The NTSB also uncovered significant issues related to icing. Empire Airlines had dispatched the airplane into icing conditions that were outside the airplane’s certification envelope. Although this practice was not prohibited by the Federal Aviation Administration (FAA), the NTSB has longstanding concerns about operations in freezing drizzle/freezing rain and as a result of this investigation made a safety recommendation to address the issue. and require all ATR 42 aircraft to be equipped with a flap asymmetry annunciator light. 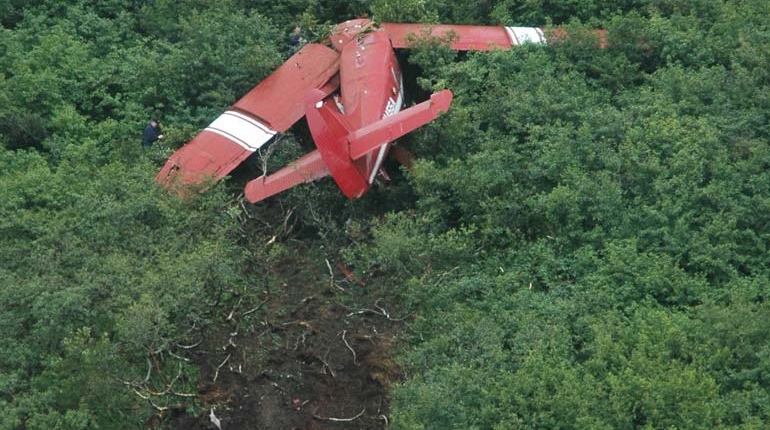 As part of its continuing investigation into the August 9, 2010 aviation accident in Alaska, the U.S. National Transportation Safety Board (NTSB) made the accident docket available to the public. Both former U.S. Senator Ted Stevens of Alaska and former NASA Administrator Sean O’Keefe were among the eight passengers aboard the DHC-3T Turbine Otter aircraft that crashed northeast of Aleknagik. The pilot and four passengers, including Senator Stevens, were killed. The other four passengers were seriously injured. The accident docket contains NTSB factual reports including: operations, meteorology, survival factors, powerplants, aircraft performance, human performance, airworthiness, and a synopsis of medical records. Also included are exhibits, interview transcripts, photographs, and other documents from the on-going investigation. Additional material will be added to the docket as it becomes available. The information released is factual in nature and does not provide any analysis. A determination of findings, probable cause, and recommendations will be released during the public NTSB Board Meeting on May 24, 2011.